Versión en español más abajo. I started my yoga practice when I was 17. Six years after that I started my teacher training program in Chile. It was the first Iyengar Yoga teacher training program in the country and when our master José María Vigar –who was send directly by Mr. Iyengar to initiate the process- showed up, we were only six people in the yoga room. That morning José María told us the story about Guruji, B.K.S. Iyengar, who when he showed up in the first class he taught outside of India there were also less than 10 people waiting for him, if I am not wrong there were only three people in the room. Despite that number Guruji continued with his program and taught that first class to a group of people who, from that day on, would not stop increasing in number. Guruji died last Wednesday at 95 years of age and these days have been hard days for the yoga community all around the world. I went to Pune for the first time in 2011. It is in this city in the western part of India that Guruji started teaching when he was 18. His master Sri T. Krishnamacharya sent him there so he could start teaching women a tradition until then exclusive for men. The first day, I walked towards the institute thinking that Guruji was in China, where he went to teach in a convention thatcommemorated 600 years of friendship and diplomatic exchange between the Indian and Chinese governments. But I was wrong. At the moment I walked up the two steps to go towards the main hall, I saw Guruji across the room: He was smiling, looking straight at me. No one else was in the room. Me, between the shock and the jet lag, I didn´t know what to do at all. I think I smiled him back and bow my head while placing my hands in namaskar. And I waited standing against the wall thinking that I could be smarter and less shy and talk to him. They were only five or ten minutes we spent alone in the hall. I constantly looked at him and, there he was, completely relaxed, smiling back at me: He must be so used to see people in shock, without knowing what to do like me, I thought. Suddenly a lot of people appeared walking down from the second floor. The 07:00 a.m. class was over. When they saw Guruji, many of the students went directly towards him and prostrate themselves in front of him, bowing their heads near the ground and touching Guruji´s feet. Oh, so that´s what you are supposed to do in front of him! What a shame on me! And, feeling that I was totally disrespectful with Guruji in my first time meeting him, I went and search for the secretary of the institute who just passed in front of me. The image of people prostrating themselves in front of Guruji´s feet stayed in my mind that whole day. There was not a single Indian in that group: lot´s of Americans, Spanish, Chinese, Greek, etc. People from many different cultures but no Indian. Why are they doing this? I asked myself. Even though those ten minutes were the only minutes I would have alone with Guruji ever, it was extremely easy to see him walking around the institute, in his house, during his practice every morning, teaching his granddaughter Abhijata and sharing his knowledge with everyone who seemed lost in the practice. And every time he walked somewhere, there you saw people prostrating in front of him. He always reacted to this smiling, moving his hand like no no no, or putting his hand over the persons head asking them to stand up. You can call me an ignorant but inside of me I had this big discussion: What´s all this with the –as I used to call it- “prostration thing”? Why are this people doing it if it´s not part of their culture? What does it mean? Does Guruji want his students to prostrate in front of him? The weeks passed and I was practicing every day feeling Guruji´s and his family´s energy around me, sharing with some other teachers and learning so much about asanas, philosophy and the tradition. Learning a lot about myself also. India was a big shock, all the clichés that you probably have heard about India are real and I was not prepared for them. Despite that, the main issue inside me was the prostration thing. I thought that since it was not a part of my culture it was not necessary to do it. I thought that all the others were faking this to look better in front of Guruji´s eyes, I thought that it was a contradictory thing since Guruji always taught us about the ego and how we must be aware of it, and there he was, accepting something that putted him in a different level from his own students. I know what you might be thinking: The ego problem was mine. One day, after some weeks of being there, we finished a class that was taught by Abhijata but guided by Guruji who was constantly calling her aside, we started walking to put back our props and yoga mats. In the way towards the door of the room there was some people stopping and prostrating themselves in front of Guruji. My first thought was: Oh, no, how ridiculous! But then something happened and my heart said: Go! I walked and kneel in front of him while touching his feet with one hand and touching my heart with the other. I put my forehead on the ground saying Thank You! and stood up looking at Guruji´s eyes who was, as usual, smiling saying that it was not necessary for any of us to do that. The moment I was able to prostate myself in front of him changed my life: At the same time I was discovering my ego for the first time and beating it up. Guruji didn´t care if I prostrated in front of him or not. I cared. The problem was not his ego, it was mine. It was my problem, my inner wall, my prejudices and my mind playing with me. My enormous ego, the size of Mt Everest. And with one small act I let it go, connecting instantly with the most beautiful feeling of humbleness and gratefulness, not only towards Guruji but towards myself, for putting me in that position that was so hard to handle until I discovered that, when in difficult position: prostrate yourself. B.K.S. 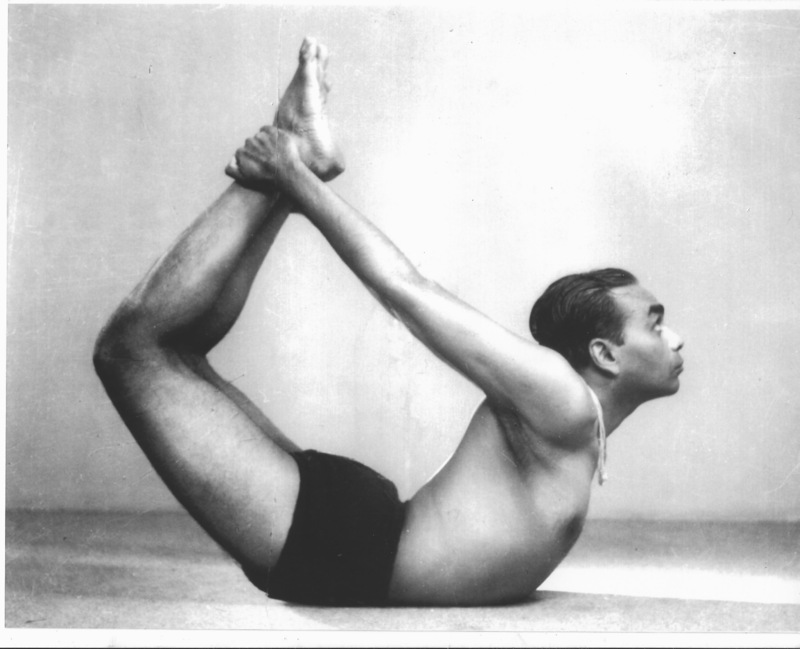 Iyengar will be known because of his incredible work stimulating yoga in the West. When we think of him in the future, we will think of his method, the alignment, the props and his passion at the moment of teaching. We will think of his bestsellers and we will imagine him doing something amazing with his body, or taking an ultra long inhalation at Harvard, receiving recognitions from universities all over the world and even from his own nation. I am in no way an authority to talk about Guruji´s life and ways of being. Out there we can find all the senior teachers that have been studying with Guruji and learnt directly from him all of the things that constitute his method of teaching. They are also responsible for the expansion not only of the method itself but also for the devotion that exists towards Guruji. We can also find the people that work close to him in his institute and in all the charity work he did in Bellur (his hometown). Out there we have Guruji´s own family that deserves all the respect and peace in this moment of changes and transition. I am just a student that had the opportunity to spend some months surrounded by Guruji´s energy and inspiration and that probably, like thousands of others, got an extremely important lesson after living that experience. I went and spend those months in India expecting to become a better Iyengar Yoga practitioner and teacher. I went there expecting to understand difficult asanas and pranayama techniques, expecting to find inspiration by meeting people that love yoga as much as I do and create an encounter with other cultures. Sometimes we think we know why we are going somewhere but I have learnt that the reason we believe in is never the reason that life has prepared for us. Thanks to this “prostration thing” I learnt to kneel myself not only in front of Guruji´s feet but in front of the immense and beautiful mystery that life is and, by doing that, I was able to realize that the finest teachers are those who help us to discover that the best master we have, we have it inside. On that trip to India I not only got what I expected, but much more: I got a better understanding and knowledge of myself observing me through the eyes of an incredible man that taught me that yoga is about learning how to deal with ourselves only to be able to go further and transcend the world as we know it. May the fire he lighted in our hearts, illuminate his way towards the Self. Comencé mi práctica de yoga cuando tenía 17 años. Seis años después de ése momento, comencé con mi formación como profesora aquí en Chile. Era el primer proceso de formación de profesores de Yoga Iyengar en el país y, cuando nuestro maestro José María Vigar –quien fue enviado directamente por el Sr. Iyengar para iniciar el proceso- apareció, habíamos solo seis personas en la sala de yoga. Esa mañana, José María nos contó la historia sobre Guruji, B.K.S. Iyengar quien, al aparecer en la primera clase que dictaba fuera de India vio también a menos de 10 personas esperándolo. Si no me equivoco, habían solo tres personas en la sala. A pesar de ése número tan bajo, Guruji continuó con su programa y enseñó esa primera clase a un grupo de personas que, desde ese día en adelante, no iba a parar de aumentar. Guruji murió el miércoles pasado a los 95 años de edad y, estos, han sido días duros para la comunidad de yoga alrededor del mundo. Visité Pune por primera vez el año 2011. Es en esta ciudad al oeste de India en donde Guruji comenzó a enseñar cuando tenía 18 años. Su maestro Sri. T. Krishnamacharya lo había enviado para comenzar ahí a enseñar a mujeres una tradición, hasta ese momento, exclusivamente masculina. El primer día, caminé hacia el instituto pensando que Guruji se encontraba en China, donde fue a enseñar en una convención que conmemoraba los 600 años de amistad e intercambio diplomático entre los gobiernos de China e India. Pero yo estaba equivocada. Al momento de subir los dos escalones hacia el vestíbulo, vi a Guruji al otro lado de la habitación: Él estaba sonriendo, mirándome directamente. No había nadie más alrededor. Yo –mezclando shock y jet lag- no supe que hacer en absoluto. Recuerdo que le sonreí de vuelta e incliné mi cabeza mientras ponía mis manos en namaskar. Y me quedé ahí, esperando, parada contra la pared, pensando en que podría ser más inteligente y menos tímida y hablarle. No dije una sola palabra. Fueron solo cinco a diez los minutos que pasamos solos. Constantemente miraba a Guruji y, ahí estaba él, completamente relajado, sonriéndome de vuelta: Debe estar tan acostumbrado a ver gente en shock, gente como yo que no sabe qué hacer… pensé. De un momento a otro, mucha gente comenzó a aparecer bajando desde el segundo piso. La clase de las 07:00 a.m. había concluido. Cuando vieron a Guruji, muchos de los estudiantes caminaron directamente hacia él y se postraron delante, inclinando sus cabezas hacia el suelo y tocando sus pies. Entonces eso es lo que se supone que debes hacer delante de él, qué vergüenza! Y, sintiendo que había sido completamente irrespetuosa en mi primer encuentro con Guruji, caminé tras el secretario del instituto que había pasado recién frente a mi. La imagen de la gente postrándose delante de los pies de Guruji se quedó en mi mente durante todo ese día. Había mucha gente de norte América, españoles, chinos, griegos pero no había nadie originario de India en aquel grupo. Gente de muchas culturas pero ningún Indio. ¿Por qué hacen esto? Me pregunté a mí misma. A pesar de que esos fueron los únicos 10 minutos que pasé alguna vez sola con Guruji, era muy normal verlo caminando alrededor del instituto, en su casa, enseñando a su nieta Abhijata y compartiendo su conocimiento con cualquiera que pareciera necesitar su ayuda. Y, cada vez que caminaba hacia algún lugar, ahí uno veía a gente postrándose por delante de él, quien siempre reaccionaba riéndose, moviendo su mano como diciendo no no no, o posando su mano sobre la cabeza de la persona pidiéndole que se levantara. Quizás lo que pasaba es que yo era una ignorante pero, dentro de mí yo tenía está gran discusión: ¿Qué es todo esto del “postrarse”?, ¿por qué la gente hace esto si no es parte de su cultura?, ¿qué significa?, ¿Guruji quiere que sus estudiantes se postren delante de él? Las semanas pasaron y yo me encontraba practicando cada día sintiendo la energía de Guruji y su familia a mi alrededor, compartiendo con otros estudiantes y profesores, aprendiendo muchísimos sobre asanas, filosofía y la tradición yógica en general. India fue un gran shock; todos los clichés que probablemente han escuchado sobre India son reales y yo no estaba preparada para ellos. A pesar de esto, lo que más me complicaba era todo esto relativo a la “postración”, pensaba que, como no era parte de mi cultura, no era necesario para mí hacerlo. Pensaba que todos los demás estaban fingiendo para lucir mejor ante los ojos de Guruji, pensaba que era contradictorio que Guruji siempre nos enseñara a estar atentos a nuestros egos, aceptara algo que lo ponía en un lugar diferente con respeto a sus propios estudiantes. Yo sé lo que deben estar pensado: que el problema con el ego era mío. Un día, al terminar una clase en la que Guruji estaba guiando a Abhijata en la enseñanza, comencé a caminar hacia la pieza en la que se dejan los props que utilizamos durante la clase. Cuando venía de vuelta, vi a algunas personas detenidas y postrándose delante de Guruji. Mi primer pensamiento fue: Oh no, qué ridículo! Pero luego, algo pasó, mi corazón me dijo: ANDA! Caminé y me arrodillé delante de él mientras con una mano tocaba sus pies y con la otra tocaba mi pecho. Puse mi frente en el suelo, diciendo Gracias! Y me puse de pie mirando a los ojos a Guruji quien, como siempre, estaba sonriendo diciendo que no era necesario que hiciéramos eso. El momento en el que fui capaz de postrarme delante de él cambió algo muy importante dentro de mi: Estaba descubriendo y combatiendo mi ego, al mismo tiempo, por primera vez. A Guruji no le importaba si yo me postraba delante de él o no. A mí me importaba. El problema no era su ego. Era el mío. Era mi problema, mi propia pared interna, mis prejuicios y mi mente jugando juegos conmigo. Mi ego, enorme, del porte del Everest. Y, con un acto pequeñito, lo dejé ir todo, conectándome instantáneamente con el más bello sentimiento de agradecimiento y humildad, no solo hacia Guruji pero hacia mi misma, por ponerme en esa posición que era tan difícil de manejar y que me hizo descubrir que, cuando te encuentres en una posición difícil: póstrate. B.K.S. Iyengar será recordado por su increíble trabajo estimulando la práctica de yoga en occidente. Cuando pensemos en él en el futuro, pensaremos en su método, en la alineación, los props y en su pasión al momento de enseñar. Pensaremos en sus bestsellers y lo imaginaremos hacienda algo increíble con su cuerpo o, tomando una inspiración larguísima en Harvard, recibiendo reconocimientos de diferentes lugares del mundo incluyendo a su propia nación. Yo no soy ninguna autoridad al hablar de Guruji, su vida y su manera de ser. Ahí afuera podemos encontrar a todos los profesores Senior que estudiaron y aprendieron directamente de él todo lo que concierne a su método de enseñanza. Ellos también son los responsables por la expansión no solo del método sino también de la devoción existente hacia Guruji. Podemos encontrar también toda la gente que trabajó a su lado en el instituto y que lo ayudó en su trabajó de caridad en Bellur (su lugar de nacimiento). Y por supuesto, podemos encontrar a la propia familia de Guruji que merecen todo el respeto y la paz en este momento de cambios y transición. Yo soy sólo una estudiante que tuvo la oportunidad de pasar algunos meses rodeada de su energía e inspiración y que, probablemente como miles otros estudiantes, aprendió una lección extremadamente importante debido a esta experiencia. Yo fui a pasar esos meses a India esperando transformarse en una mejor practicante y profesora de Iyengar. Yo fui esperando entender mejor las asanas y las técnicas de pranayama, esperando encontrar inspiración al conocer gente que ama el yoga tanto como yo y crear encuentros con culturas diferentes. A veces, creemos que sabemos por qué estamos yendo a cierto lugar. Yo he aprendido que aquellas razones en las que creemos nunca son las razones que la vida tiene preparadas para nosotros. Gracias a este asunto de la “postración”, aprendí a arrodillarme no sólo frente a los pies de Guruji pero también ante el inmenso y bello misterio que la vida es y, haciendo eso, aprendí que los mejores profesores son aquellos que nos ayudan a descubrir que el mejor maestro que podríamos tener, lo llevamos dentro. En ese viaje a India no sólo obtuve todo lo que esperaba, sino que mucho más: obtuve un mejor entendimiento y conocimiento sobre mi misma, observándome a través de los ojos de un hombre increíble que me enseñó que el yoga es algo relacionado a la manera que tenemos de lidiar con nosotros mismos, solamente para ser capaces de ir más allá y trascender el mundo como lo conocemos. Que todo el fuego que nuestro maestro encendió en nuestros corazones, ilumine su camino hacia Dios. Bello relato. “los mejores profesores son aquellos que nos ayudan a descubrir que el mejor maestro que podríamos tener, lo llevamos dentro”.